This 1½-storey Edwardian Vernacular Arts & Crafts house is unusual in that it has an oriel window in the front gable and different dormers; the left dormer is shed-roofed, and the right is gabled. Both gables and dormers are roughcast-stuccoed and half-timbered. The oriel has a flat roof over four multi-paned windows with wooden muntin bars. A pent roof which now covers the full-width verandah was added in 1984. The verandah has double and triple square posts on granite piers with wooden caps; the balusters are square. There are two short sidelights on either side of the front door and a shallow angled bay on brackets on the right. The main floor is brick, another unusual feature for this style of house. The Arts & Crafts timberwork at the top of the front gable was removed c.1960s; it survives in the gable of the right dormer. 1914: This house was built on a speculative basis for $3,000 by building contractor Alfred John Abbott (b. Devon, ENG, 1877-1957), who lived at 1502 Pembroke. He came to Canada in 1902 and to BC in 1906. He retired in 1949 at 72 and died in Saanich. A warden and long-time member of St. Barnabas’ Church (1112 Caledonia Av, Fernwood), he served with the Forestry Engineers during WWI. In the early 1930s his wife Florence Eleanora was living at 1422 Fernwood Rd. 1914-16: Civil engineer Harry Brown and Catherine Annie Ruth married at St. Barnabas in 1914. 1917-18: William McKinnon and Margaret Annie Ivel. William was the proprietor of Ivel’s Drug Store at 1200 Douglas St. By 1920 the Ivels lived in the Mount Edwards Apartments (1002 Vancouver St, Fairfield). 1925: Home furnishings salesman Cameron Percy and Frances Cummings and their offspring: labourer Cameron Sinclair, HBC stenographer and messenger Esther Frances, HBC chauffeur George, and Wallace. 1926-29: Pte. William Thomas McGibbon, RCOC, (b. Port Hope, ON, 1874-1949), and his wife Grace Mary (née Outram, b. Montreal, QC, 1874-1949). William was a hardware salesman prior to signing up for WWI in 1918, but he remained in the RCOC until retirement. 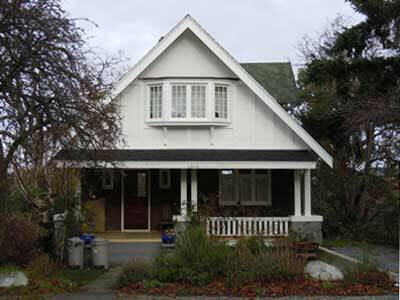 The McGibbons lived in Victoria from 1910-49. 1930-31: Violinist Miss Sarah Harriet Bowhill (b. USA, 1893-1931), who died in the house. 1933-2000: Joseph Haegert (1902-2000) and Gertrude Williams (née Day, b. Westcliff, Essex, ENG, 1908-1995). Joe was born to a Prussian medical doctor and an Irish mother in Bethel Santhal Mission, Khairbona, Bengal, India, which had been established by his father. Joe was orphaned at age three, taken to Bristol, England, and cared for by a nurse until 1910. He was brought to Victoria by a family that he later described as mean and stingy; his guardian purloined his £10,000 inheritance. The first place he lived in Victoria was at 1203-05 Yukon St, Fernwood. Joe was forced to quit school at 13 to work and earn money for his minders. He became a messenger boy driving a horse and buggy. One cold winter night he brought a telegram to this house. Through the doorway he saw a loving family in the soft glow of light, fell in love with the house, and vowed to own it some day. Joe bought the house in April 1933 and in June married Gertrude Day in Vancouver. Gertrude’s family immigrated to Burnaby, BC, in 1910. Joe met Gertrude’s Aunt Eva at a Quaker Meeting in Tintagel, Cornwall, England, and Eva gave Joe a letter of introduction to her niece, who was a teacher in Vancouver. Joe and Gertrude had four children: Joseph John, a dentist who founded Streetlink Medical Clinic, formerly Cool-Aid in Victoria in 1968 (1900 Fernwood Rd). David George, a pathologist, in 1912 chairman of the department at McGill University. Peter Edward, a mountain climber who has been missing in Australia for 10 years. Sheila Ann, a psychologist. At age 48 Gertrude went back to teaching; she also served as president of the PTA for Central High School. By 1918 Joe was a wireless operator on ships. He served from 1934 on the RMS Empress of Canada, a passenger liner which did Trans-Pacific mail runs. During WWII it was requisitioned for troop transport, and Joe was away from home for three years. However, he was working as a Senior Radio Operator for the RCAF in No.2 Group Headquarters in Victoria in March 1943 when the Empress of Canada was sunk by an Italian torpedo and many lives were lost. At the end of WWII Joe had no job. The family rented out the house and he became a wireless operator at Estevan Point off Vancouver Island’s west coast. They moved back to the house in late 1946. Joe then worked on coastal ships, as a wireless operator on Federal Department of Fisheries vessels the Kitimat and the Howay, and as a hydrographic surveyor on the William J Stewart. He retired at 60 in 1962 suffering from stress-related asthma developed in WWII from seeing so many ships sunk and hearing so many distress calls. As a merchant seaman he tried for many years to be acknowledged as a WWII veteran. He finally received that status when he was 92, and the Department of Veterans Affairs provided care for him in his beloved home until his death at 98. He had his house designated in 1997. A small park at the NE corner of Chambers and Yukon is named for the family.